I think that January is a great month for compilations and recaps of what good has happened in the last year, don’t you think so too? 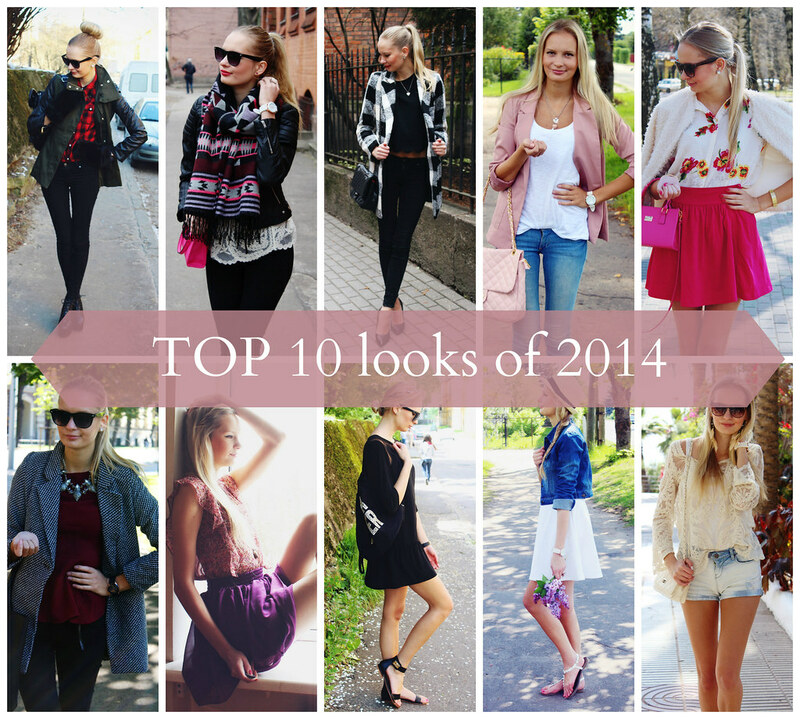 Therefore, today I am sharing with you my Top 10 looks / outfits of 2014! I put them in an order judging by the feedback I received on them ( for example, comments, likes on facebook, lookbook hypes and so on!). These are only some outfits of my the fashion I showed you this year, if you would like to see what I wore throughout the year head to my “Outfits” page! Manuprāt, janvāris ir lielisks mēnesis, kad apkopot visas savas domas un atmiņas par 2014. gadu, tāpēc šodien es jums vēlējos parādīt manus 10 labākos tērpus no 2014. gada! Outfiti ir noteiktā secībā ( par pamatu tika ņemta atgriezeniskā saite, kuru es saņēmu no jums komentāru veidā, no “like” vai “hype” facebook un lookbook utt). Kā jau vari redzēt šeit es esmu apkopojusi tikai nedaudzus no maniem 2014. gada tērpiem, ja vēlies redzēt, ko es vēl valkāju šajā gadā, dodies uz mana bloga “Outfits” lapu! Ja vēlies redzēt manus 2013. gada labākos outfitus dodies uz šejieni. You look always perfect but number 4 and number 9 are absolutely my favorite. Such a stylish BABE! Love these photos- you had such a cute 2014! You are one stylish girl but out of all these my utmost favorite is the black dress from H&M. I think you look extra fabulous in it! Have a great year! I love how dynamic your style is – feminine yet edgy and classic. I think we have very similar tastes and I love that 🙂 I can always relate to your fashion sense! You've had such a fashionable year and I can't wait to see more in 2015! Awww everything is perfect and great on their own look Maddie!!! I always adore your fashion sense and styling. They are always on fleek! Your blog will always be one of my fave fashion sites ever!!! Honestly i can't decide any top outfits in your blog because all of them are awesome <3 Kudos and more powers to your blog Maddie!!! So glad I found your blog from the very beginning! Your blog isn't the only thing that is perfect, you are also perfect!!!! I hope you get everything your good heart desires this year <3 mwah! Love these posts where the outfits are compiled for the year. Your selection is particular nice. My favorites is the first one in the black dress and the sunglasses , and then that stunning picture of you by the window, I think you called it Lilacs. You are so photogenic, and I really enjoyed seeing these ensembles.